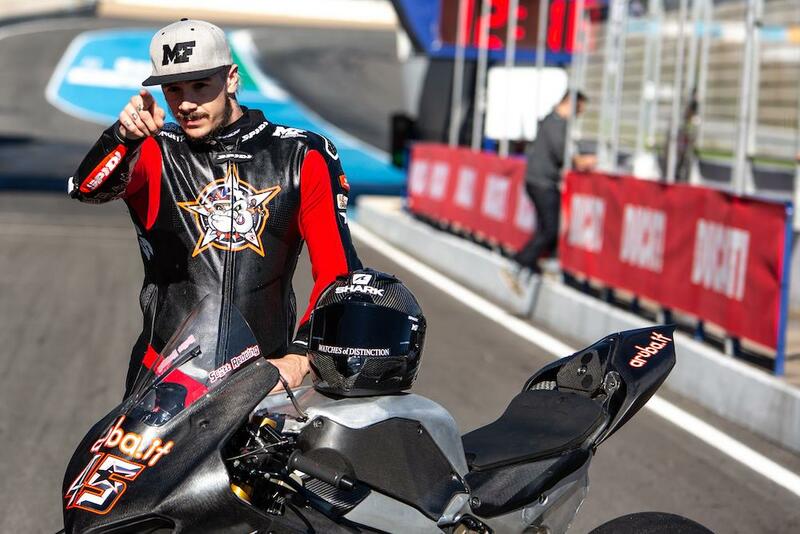 Scott Redding has said he has a ‘lot to learn’ after getting his first taste of the Ducati V4 R superbike he’ll ride in next year’s Bennetts British Superbike championship. The British rider makes the switch from MotoGP to BSB this year, but hadn’t as much as sat on a superbike since he swung a leg over the World Superbike-spec Panigale V4 R yesterday. Redding will race alongside Josh Brookes in the Be Wiser Ducati PBM effort next year, but while the factory-backed BSB squad await their V4 Rs to arrive, they were loaned two World Superbike-spec machines for this test at Jerez. The only difference between the World Superbike-spec bike and the bikes Redding and Brookes will campaign next year is that the WSB machine features Magneti Marelli electronics instead of MoTeC. However, in order to mimic regulations, Ducati Corse engineer Giovanni Crupi (Redding’s crew chief for 2019) has turned off all rider aids on the Marelli system. “Every time I go out on the bike I’m feeling more and more comfortable, trusting the bike and the tyres. I had a couple of big moments with no electronics when the tyre dropped! I need to learn that. The front tyre is OK, but I have a vague feeling as I’m used to the hard front tyre you have in MotoGP so I’m attacking like that at the minute and I’m not sure if it can hold it. “I’m trying to make small steps, work a bit to feel with minimal electronics we have. I feel good, I feel happy on the bike, the bike is working like a bike which is good but I’m just settling into it. “The bike position was quite weird at first and it was a bit strange getting used to the gearbox. The engine is quite strong, I was surprised at how strong it is to be honest. “The biggest thing for me is understanding when the tyre drops, because it just lets go! It’s OK after, it’s just getting used to it.